The Calmark Group, LLC, is one of the leading full-service, single-site direct mail fulfillment operations in the U.S. The Company was formed in May 2012 upon the merger of two previous competitors. Due to certain merger-related issues and the fact that the original loan officer had moved to a different institution, the Company’s bank did not want to continue the relationship. The company had been seeking a new banking relationship on its own but was not satisfied with the progress it was making. After being introduced to the Company, Concord’s assessment of the situation was that the Company was strong, under solid management and would be an attractive client for any number of financial institutions. The Company subsequently retained Concord to search for and secure a long-term banking relationship with a new institution. Concord created a detailed memorandum featuring the Company’s strong management team, competitive strengths in its market and highlighted the plan to maintain and grow profitability and cash flow. 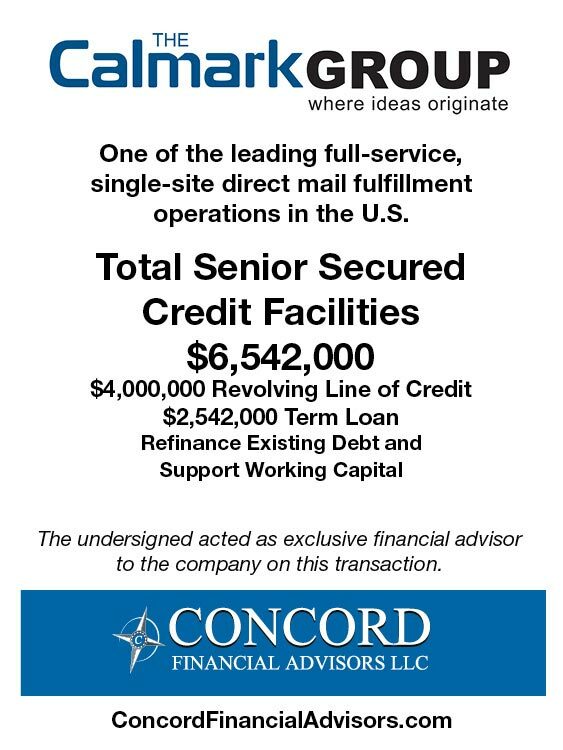 After conducting a targeted search process to local, regional and national commercial banks that generated several Term Sheets, Concord secured a commercial banking proposal that met the Company’s objectives and closed the deal.